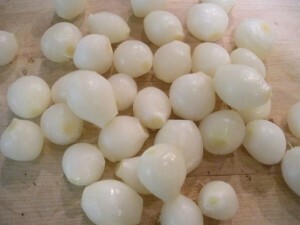 I haven’t been able to find frozen pearl onions in Calgary for years now. But to peel each one with a paring knife is a big pain. But here is a method to cut down the pain. You could also buy a few bags at the Farmers market in the fall when they are cheaper. Peel using the method below then freeze on a cookie sheet. When frozen put in a ziplock bag for future use in the freezer . Plunge the little buggers in said boiling water for two minutes. Drain them, and pour them into a bowl of ice water. After you’ve let them sit there until they’re cool enough to handle, drain them again, then get to work. One quick slice at the bulb end, a quick squeeze at the other end, and those little babies pop right out of their skins.